Mmm…fall is here! Leaves are turning into a riotous mass of red, orange, and yellow here in the North Georgia mountains. When I walk outside the air has a nice crisp bite. The wind playfully moves through the trees. I take morning and evening walks through the woods in my backyard. It is so much fun to watch all the animals, especially the squirrels, preparing for winter. The twins enjoy it too! In the evening I like to curl up on the couch with a blanket and a nice cup of Hot Cocoa, and you know what goes great with Hot Cocoa, homemade flavored marshmallows! Image from:http://www.marshallsfudge.com/store/NEW-Chocolate-Covered-Peppermint-Marshmallowsyou could use to flavor them. My 3 favorites are peppermint, cinnamon, and orange essential oils. 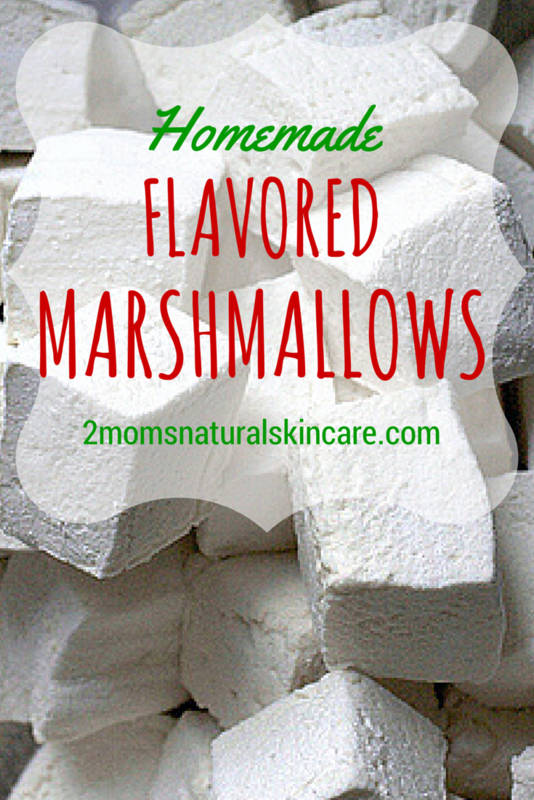 These marshmallows are also a great, yummy way to help get your daily dose of gelatin. Gelatin is great for your skin, hair, nails, bones, and joints! Please note not all essential oils can be ingested. I only use Young Living Essential oils to flavor my food, you can find out more about their oils and how to save 24% on your oily purchases here. I get my marshmallow root from Mountain Rose Herbs. I use grass fed gelatin from here. As an added bonus to all this sweet ooey-gooey goodness, marshmallow root can help soothe sore throats! Boil 1 cup water and let the marshmallow root steep in it for about 15 minutes. Then strain. Pour half the water into a miking bow or stand mixer along with the gelatin and whisk together. Pour the remaining water into a sauce pan with the honey and heat on medium until it reaches 230° on a candy thermometer. Turn on stand mixer or hand mixer and slowly, very slowly, pour in the honey and water mixture continuously mixing on medium. Once all the honey mix is incorporated turn your mixer on high and beat for 5-10 minutes until it has turned white and forms soft peaks. Right before soft peaks are formed go ahead and add in your vanilla and essential oil. Pour mix into a greased (I use coconut oil) 9x13 pan. Let set overnight or for 8 hours. Turn marshmallow out onto a cutting board sprinkled with powdered sugar or corn starch. 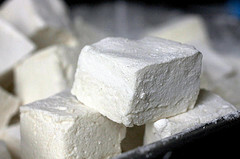 Use a lightly greased knife to cut marshmallow into squares. Or us a greased cookie cutter for fun seasonal shapes. To keep marshmallows from being sticky lightly coat them in corn starch or powdered sugar. This entry was posted in Essential Oils, Recipes. i have a question. 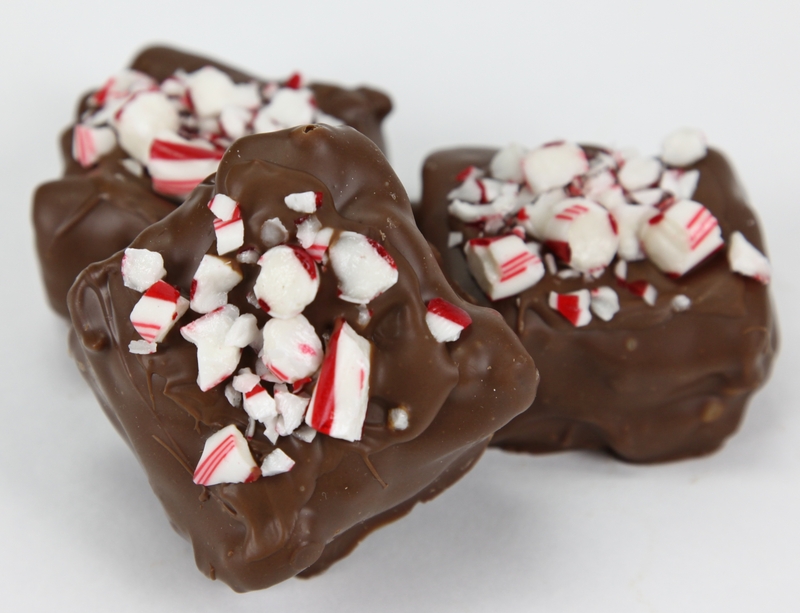 I just made these today and the marshmallow root that I got from Mountain Herbs was powdered. Is this correct? I am thinking from the recipe that maybe that was wrong. If so, how much powdered would you use? I made the according to recipe even though it was powdered and either that was too much or I beat a tad too long as I could not spread them smoothly in the pan. They were already setting up too much to get any decent shape out of them. The taste was great but i want to get this really right. Please help. I have personally never used powdered mashmallow root in mine but I would probably use 1/2 to 1 teaspoon since it will be staying in and will therefore be stronger. I think they probably got beat a bit too long if you were having trouble getting them into the pan. If you run into this problem again try greasing a piece of parchment paper and placing it on top of the marshmallow and pat it gently into the pan. I hope this helps! Thank you so very much. It must have been the beating as they were actually “setting” up so couldn’t even be pushed down in the pan. FYI The powdered root didn’t make them too strong….. they are very tasty. They are a bit denser and bouncier than what I remember marshmallows to be but they did melt nicely in the hot chocolate. 🙂 Thanks again for touching base and leading me into the right direction. It is most appreciated. You’re welcome. Another thing I just thought of is that if you have cold/dry weather right now the setup time may be faster than usual. The fast set up/over whipping is probably why they are denser and bouncier. If you ever have the same problem let me know and I will play around in my kitchen and see if I can figure out what is going on for you. I am so glad you liked the way they tasted, I think homemade marshmallows are sooo much yummier than the store bought kind!